Discover the beaches, Mayan temples and colourful villages of the Yucatan Peninsula by bike. After Cozumel Island we visit the colonial towns of Merida and Valladolid and cycle through colourful Mayan villages on quiet roads with chances to swim from beautiful beaches. Finally we explore the Sian Ka'an Biosphere and relax. Please note that the May 2019 departure will start each day early to avoid cycling at the hottest time of day. Our journey begins in Playa del Carmen. Located on the northeast coast of the Yucatan Peninsula, Playa del Carmen is a coastal resort town known for it's coral reefs and palm-fringed beaches. There is a good range of international flight options into nearby Cancun. This morning we catch a ferry for the short journey across to Cozumel Island where we start today's ride. Each year the island hosts an 'iron man' event and we plan to cycle a similar route at a much more sedate pace! You will have time firstly to familiarise yourself with your bike and make any necessary adjustments. Once everybody is comfortable we will start our route, with the first 15km on paved road as we cross the island from west to east where we will try to stop for a fresh coconut water at a bar on the beach. We cycle with the sea by our side as we make our way down the island. Our final kilometres brings us to the Bob Marley bar and museum where we can relax in hammocks and have a swim. We return to the ferry port by vehicle with the option to cycle if timings and daylight allow. 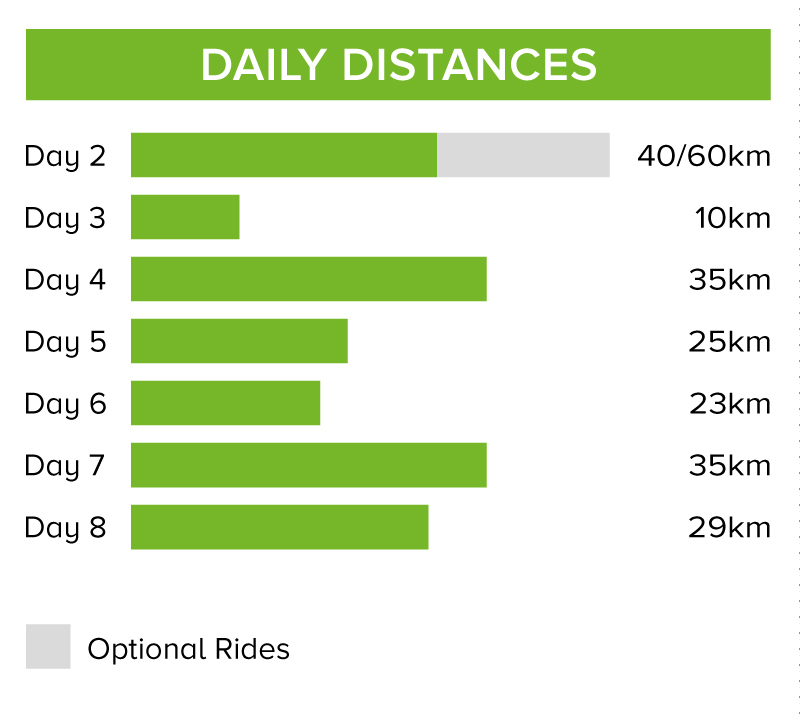 Our total cycling distance today is approximately 40 kilometres (flat, paved roads) with an optional additional 30 km. Early this morning we leave Playa del Carmen and drive inland (2 hours) to Chichen Itza. Founded in AD432 and conquered by the Toltecs in the 10th century, the culture of the Maya and the Toltec gradually fused. Chichen Itza is one of the most outstanding archaeological sites in the Americas and we visit the site with a local guide before enjoying some free time to explore further. Founded in AD432 the city is believed to have reached its zenith during the Terminal Classic Period (800-1000AD) and remarkable sculptures adorn the pyramids, palaces, temples and ball court (where death was the penalty for defeat). We drive a short distance to Yokdzonot Cenote where we have free time to enjoy a refreshing swim and lunch (not included). Cenotes are natural pools formed in limestone and used by the ancient Mayan culture as a source of fresh water. Finally we drive (1.5hrs) to Merida and commence our introduction by bike on a 10km cycle around the city. Please note that depending on arrival time and sunset hours, it may be better to move this ride to the early morning of day 5 - your tour leader will advise. Famed for its beautiful Spanish-Moorish style architecture, Merida was founded in 1542 by Francisco de Montejo and the city was built over the ruins of a Mayan city. Trade with Europe during the Spanish colonial rule brought the city great wealth that is now reflected in the many grand mansions, churches and plazas that lend the city a faded elegance and more of a European feel than elsewhere in Mexico. Merida is now the capital of the state of Yucatan and is also known as the 'White City'. Our total cycling distance today is approximately 10 kilometres (flat, paved roads). We start the day with a drive to Dzilam Bravo that should take around 1.5 hours. En route we plan to stop at Dzilam Gonzalez to see an unrestored archeological site in the main square. Today's cycle ride takes us up to the Yucatan north coast as we ride alongside the Caribbean, past small fishing villages until we reach the palm-fringed sands of San Crisanto Beach. You may like to have a dip in the sea before we help in the preparation of our seafood lunch, including shrimp ceviche and fish. While at the beach you will also be able to learn a little about some of the exotic local drinks and your Tour Leader will show how to make drinks such as Michelada, Chelada or Red Eyes. Later this afternoon we return to Merida by bus. At night we visit a local house or local restaurant to try a typical food and local experience called Taquisa (Tacos party). Our total cycling distance today is approximately 30 kilometres (flat, paved roads). This morning we bid farewell to Merida with a short early drive to Tixpehual where we start today's cycle. Depending on arrival time and sunset on day 2 we may have a early morning dawn ride around Merida this morning before breakfast. We ride through several interesting little villages to Ake. We finish cycling here and drive to the colonial backwater of Izamal. Following the Spanish conquest a colonial city was founded atop what was an important Mayan ceremonial site which became a focal point of the Spanish attempts to convert locals to Catholicism dominated by a 16th century Franciscan Monastery. After exploring the site we try local dishes such as salbutes, panuchos and empanadas for lunch. In the afternoon there may be time to see the local handicraft workshops (if open) before we drive (1.5hrs) to colonial Valladolid where we spend the next two nights. Our total cycling distance today is approximately 25 kilometres (flat, paved and dirt roads). We leave early today with a drive (2 hrs) north to the coastal town of Rio Lagartos where we start our ride. Our ride ends near the little village of Las Coloradas home to the remarkable pink lagoons where locals harvest massive quantities of sea salt. The colours derive from specific unicellular algae called 'dunaliella salina' that has pink and red pigments. This algae is the base of nutrition for birds such as flamingos and spoonbill herons and is usually found in places with large concentrations of salt. From here a short drive brings us to a secluded beach where you have a chance to swim. Another short drive takes us to the fisherman's village of Rio Lagartos for a seafood lunch (not included) (vegetarian options available). We then take to the waters for a short boat excursion seeking out local birdlife. Finally we plan to learn all about tequila and you will have a chance to try some before returning by bus to our hotel in Valladolid. In the case of bad weather the Tour Leader may need to alter today's itinerary. Our total cycling distance today is approximately 35 kilometres (flat, paved roads and compacted sand paths). We bid farewell to Valladolid this morning as we head east back to the Caribbean coast. First we drive (1hr) to Xiulub village where we start our cycle ride via small interesting villages on a secluded road amidst thick vegetation towards Coba town where we stop for lunch (not included). We continue by bus to our hotel in Tulum town then later this afternoon visit the Mayan site with a local guide. The ruins of Tulum enjoy a dramatic setting perched atop a cliff overlooking the turquoise waters and white sand beach below. The city was guarded by a watch tower and thick ramparts which reflect the late Mayan period that Tulum dates back to, when there was increasingly enmity between Mayan city-states. Our total cycling distance today is approximately 35 kilometres (flat, paved roads). Early this morning we will drive the short distance to the entrance of the UNESCO Sian Kaan Biosphere Reserve. One of Mexico's largest reserves with about 120 kilometre of coastline Sian Ka'an means 'Origin of the Sky' in Mayan. We only scratch the surface of the reserve on our cycle excursion and the chances of spotting wildlife is limited but this vast reserve supports a large number of migratory and resident birds and marine life, as well as famous mammals such as the Jaguar, Puma, Ocelot and Tapir. Landscapes are equally varied with pristine wetlands, lagoons, mangrove forests, dunes, tropical forests and palm savannah. We cycle 14.5 km on a dirt path into the reserve surrounded by dense tropical vegetation, until we reach a bridge that overlooks a lagoon and mangrove forest (Boca Paila). We return by the same route. The rest of the day is left free and you may choose to kick back and relax on the beaches of Tulum or even revisit the ruins to see them in a different light. Our total cycling distance today is approximately 29 kilometres (flat, paved and dirt roads). The tour ends in Tulum this morning after breakfast. The drive to Cancun International Airport takes around 2 hours. Mexico is a vast country whose weather varies by season and region. The optimum time to travel is generally between December and April when rainfall is at a minimum. Temperatures are coolest between December and February and temperatures start to rise from March and the hottest months are May, June and July. The rainy season runs from May until October when humidity and temperatures are highest. The rains tend to be intense and short, clearing the humidity before building up again. The Caribbean coast can be affected by hurricane season between June and November. Please bear in mind that at altitude the temperatures can drop considerably at night and sudden changes can occur at any time. Spanish is the official language, but around 50 languages/dialects are also spoken by the indigenous peoples of Mexico. When cycling: quick drying cycle tops, padded cycle shorts, lightweight wind and water proof jacket and warmer breathable layers where local conditions require. General: Pack layers of clothing, essentially for mild or hot weather depending on the time of the year. We recommend you bring a daypack and one main piece of luggage (total allowance: 44lb/20kg) which will be transported between hotels while you cycle. Check the bike details section to see if a pannier or handlebar bag is provided on the bike. On all Explore cycle holidays we strongly recommend you bring along and wear your cycle helmet. In case of an accident resulting in personal injury, certain insurance policies are invalidated in cases where a helmet was not being worn. Cycle glasses to protect against dust, pollen and the sun, padded cycle gloves and a water bottle or water delivery system (e.g. camelback or platypus) are also useful. You may choose to bring your own gel seat cover for added comfort. If a handle bar bag or pannier is not provided (check bike details) then you may like to bring a small rucksack to wear while cycling. Other items to consider bringing are a sunhat and sun cream, torch, earplugs and insect repellent. Please carry some or all of your cycling equipment e.g. helmet as part of your hand luggage. Although entirely voluntary, tipping is a recognized part of life in this region of the world. Some local staff will look to members of the group for personal recognition of particular services provided. In order to make things easier for you, the Tour Leaders may organise a group's tips kitty and if this is the case, they will account for it throughout the tour. We recommenr US$50 for this kitty. We recommend to take a minimum equivalent of GBP 300 - 400 of your total spending money in cash for a two / three week trip (approx. GBP 200 for the CMX). USD are not widely accepted in stores and restaurants however they can be exchanged in all major towns and cities. Sterling can only be exchanged in Mexico City. Mexican cash can be obtained from ATMs that are available in most major cities. Sterling or Dollar notes should be in good condition otherwise they might be difficult to exchange. MX/MXY/MXS customers – on arrival in Mexico city airport we recommend that you use one of the many ATM´s at the airport to directly get local currency, or change GBP or USD at a currency exchange for the start of your trip. For those continuing to Guatemala on the MX/Y we also recommend you change approximately GBP 50-60 into Guatemalan Quetzals at Mexico city airport as there is no longer an exchange at the border crossing into Guatemala. Mexico: Citizens from UK, New Zealand, Australia, New Zealand, US and Canada require a Mexican Tourist Card to enter. This is obtained on arrival, at some check-in desk of the airline you are travelling with or online in advance from the following website - https://www.inm.gob.mx/fmme/publico/enolicitud.html . Please note that due to the requirements of the online system, the advance option is only possible if your passport is valid for at least 6 months from your intended date of entry to Mexico. You must take a printed copy with you which you will present on arrival with your passport. You will need to be kept this on you until you exit Mexico. Other nationalities should consult the relevant consulate. All visa information is subject to change. You should confirm all visa related issues with the relevant Embassy prior to departure. Nothing compulsory, but we recommend protection against typhoid, tetanus, infectious hepatitis and polio. Please consult your travel clinic for the latest advice on Malaria, Dengue and Zika Virus. Please take preventative measures to avoid mosquito bites - these include mosquito repellent as well as long trousers and long sleeve shirts to cover up when necessary. Please note many countries in Central America, South America and the Caribbean require a yellow fever vaccination certificates if travelling from infected areas. A detailed list of these countries can be found on the NaTHNaC website - http://travelhealthpro.org.uk/countries. Also on the NaTHNaC site there is a list of Countries (and specific areas within a country) which are at risk of infection and a vaccination is therefore recommended. Please check the latest requirements with your travel clinic or doctor prior to departure. The above is not an exhaustive list. Further information regarding vaccinations and travel health advice can be found by following the NHS and NaTHNaC links at Explore Travel Health and from your local healthcare provider. Visa and vaccination requirements are subject to change and should be confirmed by you before travelling. On this tour we cycle 197 km over seven days (an average of 28 km per day). The terrain is mostly flat we ride on a mixture of tarmac and dirt roads. A support vehicle accompanies the rides throughout the tour. We have graded the route as easy. 10 gear Specialized hybrid bikes with front suspension. Your included bike is a 10 gear Specialized hybrid bike with front suspension and will be the correct frame size for your height. A small handlebar bag and water bottle holder are included as well as the facility to fit your own pedals or saddle if you wish to bring them. A support vehicle accompanies the rides throughout the tour. We provide spare parts and take care of the day to day maintenance. All you need to bring is your own helmet.